body, the doll had this body but in the inside of the body I found 2 speaker grills and I know she was original because she had never been opened. years. So why the closed voice box? My meaning is below. 4. She has a black record dated 1961 but I have found a 1962 record in her body. (one time in an unopened doll). 5. 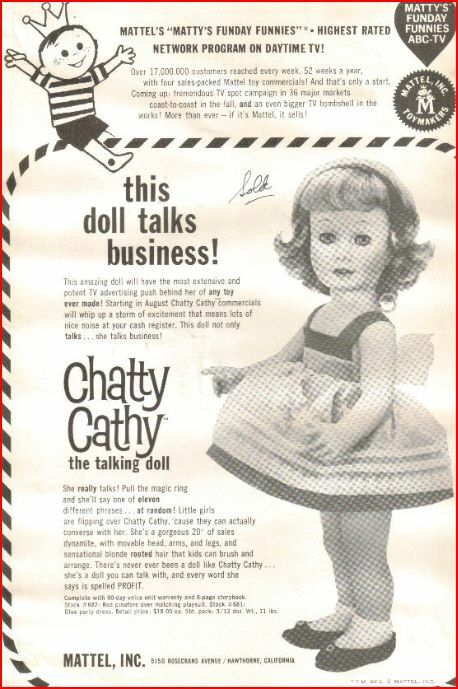 She is a loud and clear talker like 4 & 5.
doll should be the one called the transitional Chatty Cathy made after number 2 but before number 4 but yet is not a number 3.
they were made. So I have no questions with them. This body will continue to confuse me until the day I die, I swear. can come with white, yellow and peach colored limbs. Canadian dolls come with Canadian peach colored limbs. limbs. Canadian dolls come with Canadian peach colored limbs. box in order to fix her. Three of them have black paper speakers and are quiet talkers. One (#???) has a white plastic speaker and is a loud and clear talker. Information Below Taken From My TidBits & FAQ page under Chatty Cathy & Her Body Types. head that you will see small pea size white spots or "chatty measles") #2 ??? is also the one I see coming out of Canada a lot. 1961 and says 11 phrases maybe 0.5% of the time. PS: 9 times out of ten she will come with a red paper speaker. The Way These Dolls Are Listed "Numbered"
able to see a white plastic speaker. as the #5 above. She says 18 phrases 98% of the time, 2% of the time 11 phrase. If she is French doll 11 phrases, Spanish 18. Notice the grill is completely covered with holes. 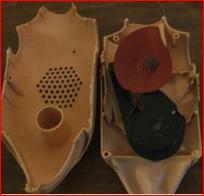 The picture top left is showing the red paper speaker. doll. Always says 11 phrases, never 18. This body can have 2 of the 5 body stamps. The orange record number 3 from left to right is found in about 30% of the number 5 dolls and says 18 phrases. The white record is in maybe 5% of the dolls and is very rare and says 18 phrases. prototype and number 1, 2 and ??? dolls. speaker. You will also find a black or brown record. number 1, 2 and ??? really doesn't matter, what matters is what that grill looks like because the grill will tell you what is inside that body. Canada and remember the #1 body is the very same body as the prototype the only difference is the Mattel stamp on the back. Cathy doll please click here. 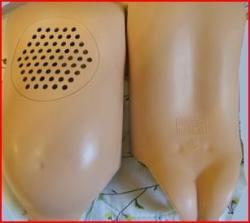 Chatty Cathy Doll Body and Parts. found a dated 1961 record inside this body so this doll was made for a long time. 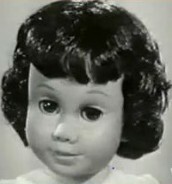 This doll was made all of 1960 and into 1961.
number wasn't added to the back until 1962 as per patent records, click here to view those documents. white plastic speaker she will also be stamped with the Mattel patent number. 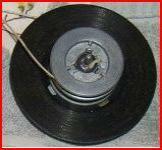 that pushes the needle down onto the record holding it in place, meaning the speaker does not move. grill. This doll is a VERY bad choice for repair. Read more about her below. below. It is a very good body for repair 99% of the time this body can be repaired unlike the #3 above. 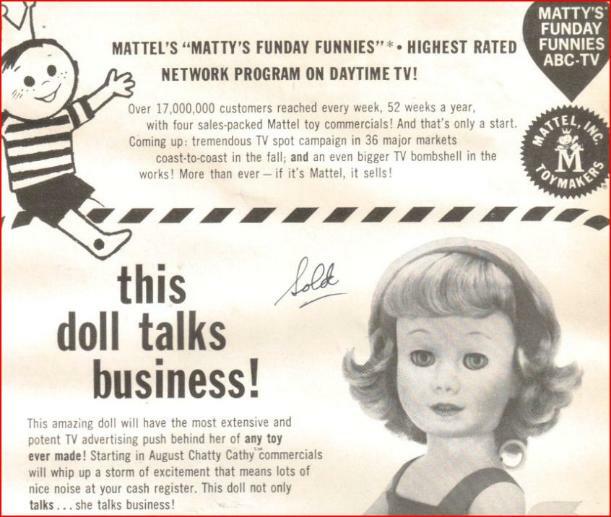 Mattel bought Dee & Cee was because the Canadian Chatty Cathy doll was doing so well. I have also read Dee & Cee closed down in 1964.
speak. The extra holes helped her talk better or rather sound better. 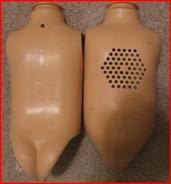 I will go along with ventilation holes because they also help ventilate the body. record inside the doll and saying she was made that way when she wasn't. Just be careful when buying and always look at that grill. Time Line & Picture (Click Here) By Years The Doll Was Made. 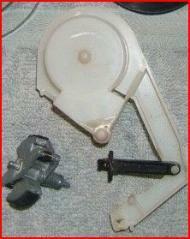 Notice (above) this body can have 3 of the 5 body stamps. Number 0 Grill #1 "Prototype"
yellow and peach colored limbs. Canadian dolls come with Canadian peach colored limbs. American soft or hard head or Canadian soft head. But I do not see her as a Hard Head pigtail very often. Measles. This doll also comes a lot of the time with the really bad white limbs and can have the open right hand a lot. limbs. 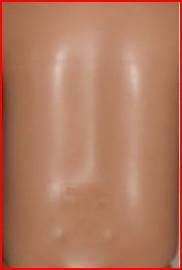 Canadian dolls can come with Canadian brown or peach colored limbs. can come on any of the dolls except for the prototype doll below. doll and the Prototype is the writing on her back. The prototype back is not stamped. Yes, I have seen this body come out of Canada. 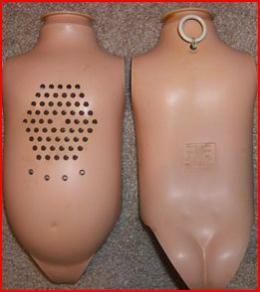 This doll always has an open neck ring. Came with the brown limbs. always soft and can have blonde or brunette hair with both blue and brown eyes. Came with the brown limbs. This doll is the Prototype. She has a closed voice box and a black or brown record that says 11 phrases. Her record is dated MCMLX or 1961.
on into 1961 is my best guess. Canadian Body?? Yes and No, (Please read below under "Prototype" additional information). 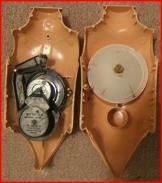 (above and below) to show the differance in the closed voice boxes. T.M. Â©1961 BY MATTEL INC U.S. PAT. 3017,187. OTHER U.S. & FOREIGN PATS. PEND. PAT'D. IN CANADA 1962.
in any doll, blonde, brunette & redhead that said 11 phrases. 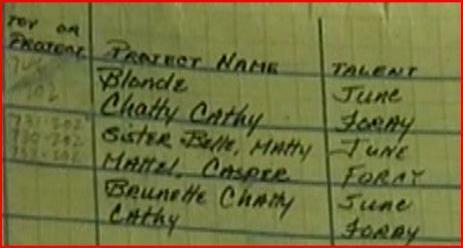 (Above) Snippet from the 1998 remake advertizment video showing the Chatty Cathy recordings by June Foray. Left side shows 1960 the first tape made and right showing 1961 recording both by June Foray. the 1998 advertisement video. (I think) I can't remember but I am using them on a few of my pages. (Above) Snippet from the 1998 remake advertisement video showing the Chatty Cathy recordings by June Foray. 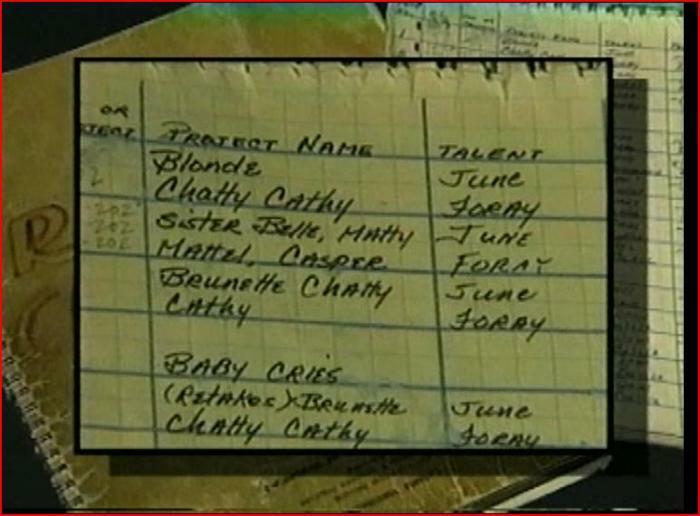 Look to where it says Blonde Chatty Cathy Talent June Foray and below that it says Brunette Chatty Cathy Talent June Foray. 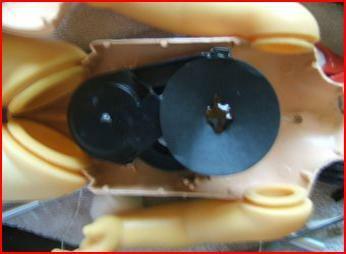 records were place in many different dolls such as the brunette prototype and the hard heads Paige Boys both blonde and brunettes. BLON or BRUN with 11 phrases dated 1961, that have come in all the dolls except #4 and #5 and have found one or two in the #4 doll. information on this record is filed under 201 or 202 in Mattel filing system or it could be the number of the machine it was made on.. This is also more proof that the Spanish doll was made her number is 161-202. KIND DOLL. Even more so than any other doll that Mattel made or anyone has ever made. be a collectable doll forever. So it doesn't matter what Chatty Cathy doll you have or which one you like best all of them are Unique. blue eyes. See and read pictures below. 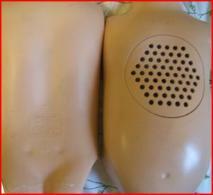 (above) Speakers inside the dolls body. box with the red paper speaker (center picture). 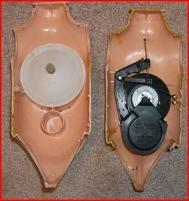 (below) to show the differance in the closed voice boxes. 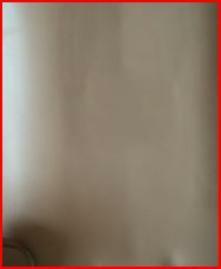 (below) show the black body. Notice this body has a closed neck ring. First one I have found on a #3 body. Note: PIctures of the Black Body are below under "Body Parts" Scroll Down or Click Here. is a perfect example of how these dolls were made. when someone looks at her they think "Oh My God"
is, "she came this way". did not scratch so easy and she now said 18 phrases instead of the original 11.
prototype the only difference is the Mattel stamp on the back. 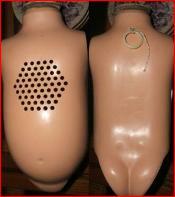 All three records (meaning MCMLX, 1961 BLON and 1961 BRUN) can be found in the "Prototype doll". So that body was still in use in 1961.
because the Redhead soft head came out and now they used both records in the 3 different colored haired dolls. one first happen with body #3.
pigtails. Plus the limbs too from brown to white, to nice and pink. because the doll was doing so well in Canada. sayings are on the front of the first 1959 boxes. up. It was mass-produced probably more bodies than they had records for or vice versa depending on where the doll was made. 1962 The hard head pigtails and the #4 and #5 bodies came out with the last record dated 1962 and the doll now said 18 phrases. these two bodies #4 and #5. 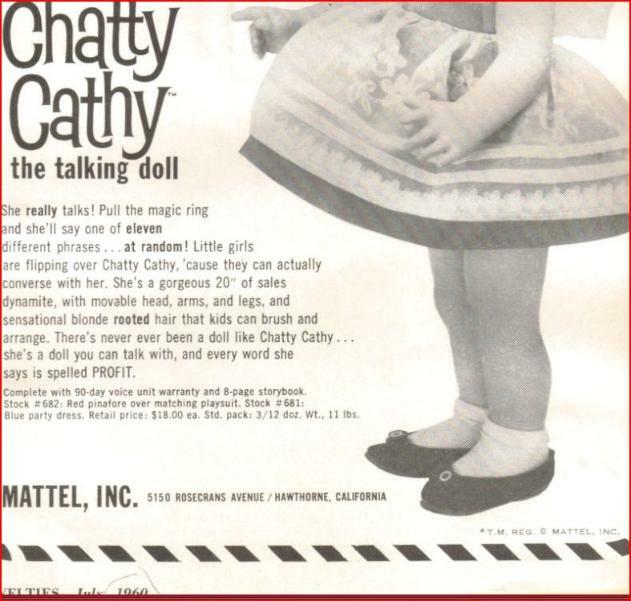 Chatty Cathy doll. But I am sure the Glassine eye was used. fit the description below doesn't belong or some think is a very rare doll. 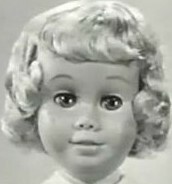 A Canadian soft head blonde or brunette bob with pinwheel or glassine eyes on a #2 body with Canadian peachy colored limbs. different heads, bodies and limbs dressed in different clothes and came in different boxes. 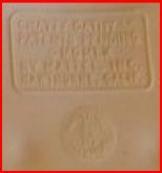 Notice (above) this body can have 2 of the 5 body stamps. down) is the only one that says. can be 99.9% sure she will say 18 phrases. All the rest say 11 phrases. are other foreign talkers out there. the grill when you are buying the Chatty Cathy doll. 2) Vamos a campo. Letâ€™s go to the country. 5) CuÃ©ntame un cuento. Tell me a story. 6) Estoy cansada. Iâ€™m tired. 7) Hola. Â¿QuÃ© tal? Hello. How are you? 8) Tengo sueÃ±o. Iâ€™m sleepy. plastic speaker. It's still a little confusing but I am sure at least that the box below was made AFTER the #5.